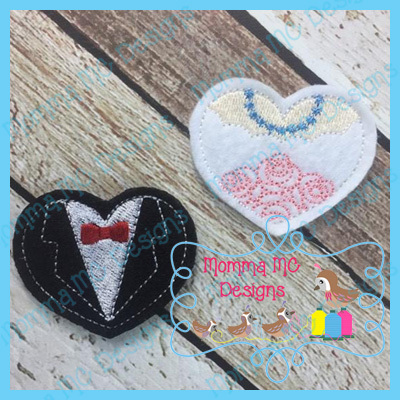 You will receive files for both the Bride and Groom Heart Felties. Each size is grouped and sorted in both 4x4 and 5x7 hoops for easy stitching of multiples. All design files are copyright Momma MC Designs for use by the purchaser only. Sharing, copying, trading or re-selling Momma MC Design files is prohibited. You may use the tangible items you make from Momma MC Designs in your own small business.